Price listed is for each ring. 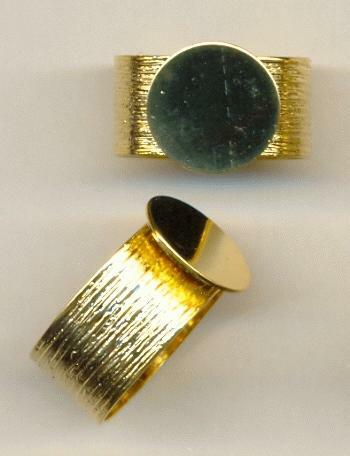 These are adjustable brass rings with a soldered 13mm (about 1/2'') flat base. They have been plated in 24kt gold plate. The decorative brushed metal ring base measures about 10mm wide. These are great rings for collaging or for attaching vintage jewelry parts (ie. old ear clips). The base is soldered at the point where the ring adjusts so that the adjustment will be hidden. Some of these have come in very dark under the overlap. This can only be seen when the ring is adjusted up a size or two. Polishing helps to some degree, but some will not polish out completely. We have no control over this and will not be able to pick and choose. It's the luck of the draw!